In the past few years, the months of May/June have become synonymous with Artemis Art’s annual “pilgrimage” to Yogyakarta. 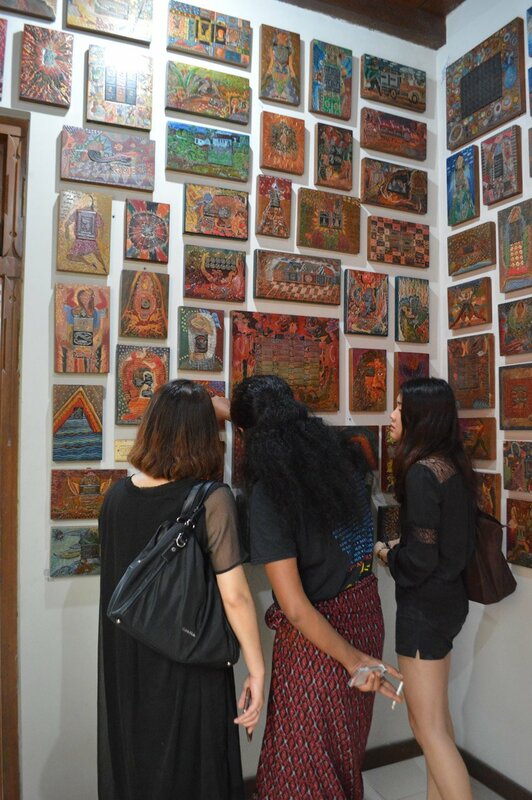 The primary reason for this annual trip is, of course, ArtJog – the annual art fair that has become the barometer for Indonesian contemporary art. In the ten years since this annual art fair has been in operation, what has happened is the burgeoning of fringe and parallel events, primarily exhibitions, that have been held to coincide with the month-long ArtJog. More recently, these fringe/parallel events has gotten a collective name, Jogja Art Weeks (JAW). This year’s trip provided a new dimension for our annual visit, playing host to a few friends from Hong Kong, the US, and of course, Malaysia. So to maximize everyone’s limited schedule, we paid visits to selected artists whom we’ve worked with, and a few other important artists based in Yogyakarta. This, of course, in addition to making our rounds to the numerous exhibitions taking place as part of JAW. Among those artists we visited included Dedy Sufriadi and Indra Dodi, two contemporary Indonesian visual artists we’ve been exhibiting for the past few years, and whose works will be among those featured later this year during Art Jakarta 2017, at the end of July. A more complete set of images from our visit may be found on a dedicated album on our Facebook page. During our chat with Basrizal, we discovered that his fascination with stone began since he was very young. While sculpting with stone, done as expertly as Basrizal is able to, is already a skill to be admired, there are two things we found truly fascinating about this artist. First is his ability (through his vast experience) to “read” the nature of a particular piece of stone, by visual observation, as well as by listening to the sound generated when a piece of rock is knocked. Visitors to the annual Padang artists exhibition, BAKABA (which we’ll talk about in a future posting) will have noticed a unique fossilized wood and granite sculpture, entitled “Nyayian Hutan” (loosely translated: Forest Song). Known for his stone sculptures, Basrizal Albara was born in Bengkalis, Riau, and is a graduate of the prestigious Institut Seni Indonesia (Indonesian Institute of the Arts, or ISI) like many of his contemporaries currently based in Jogja. Basrizal specializes in stone, particularly stone containing fossilized fauna and flora. During our visit to his studio we saw all manner of fossilized stone that he’s collected over the years, plus works in progress including what will be a colossal 13 meter stone sculpture destined for exhibit at the National Gallery in Jakarta later this year. 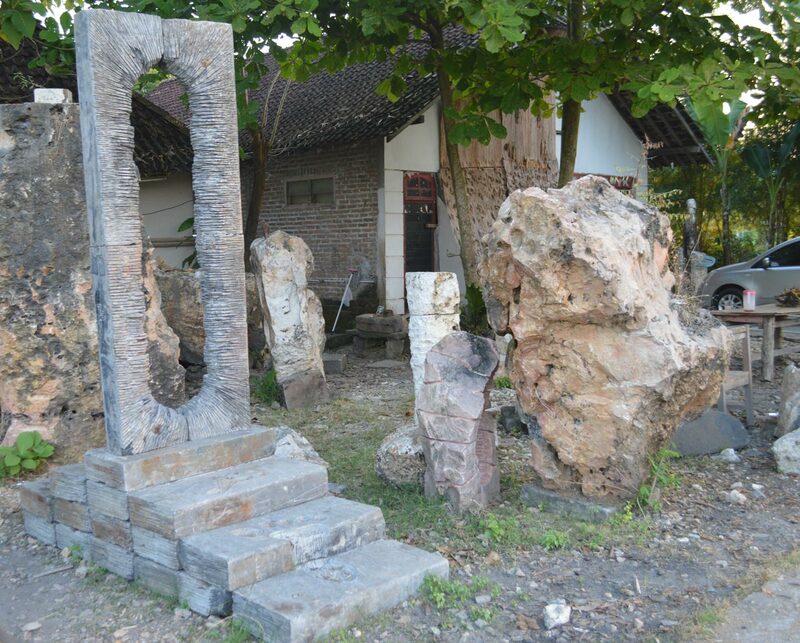 Back in 2013, Basrizal set a record of sorts with a stone sculpture measuring 9 meters in height, “Sepasang Kekasih” (A Pair of Lovers) exhibited at Sangkring Art Space as part of a group exhibition “Pasrah Marang Gusti” (a Javanese term meaning ‘Surrender To God’). Basrizal’s large sculptures reveal a second fascinating characteristic of his practice, and that is his ability to arrange/stack rocks with such precision, without much (if any) calculations. We’re told that this skill has pretty much become second nature to the artist. It will indeed be interesting to see the 13 meter tall sculpture once completed, and displayed at Galeri Nasional (National Gallery) in Jakarta later this year. Since our very first participation in Art Expo Malaysia back in 2012, one artist has consistently featured in almost every single art fair we’ve taken part in. That artist is Dedy Sufriadi. It goes without saying, therefore, that no visit to Yogyakarta would be complete without dropping in to visit him at his studio. Text and abstract figurative elements have been key features of Dedy’s recent works in the last four or five years, navigating between the intellectual, intuitive and the logical. Coupled with his strong composition skills, Dedy Sufriadi’s art pieces provide a visual balance that invites the viewer to ponder comfortably while gazing and understanding the emotional intellect that is imbued within them. As we’ve mentioned more than once, Dedy Sufriadi is the most well-read artist we know personally, particularly in the area of Existentialist philosophy. 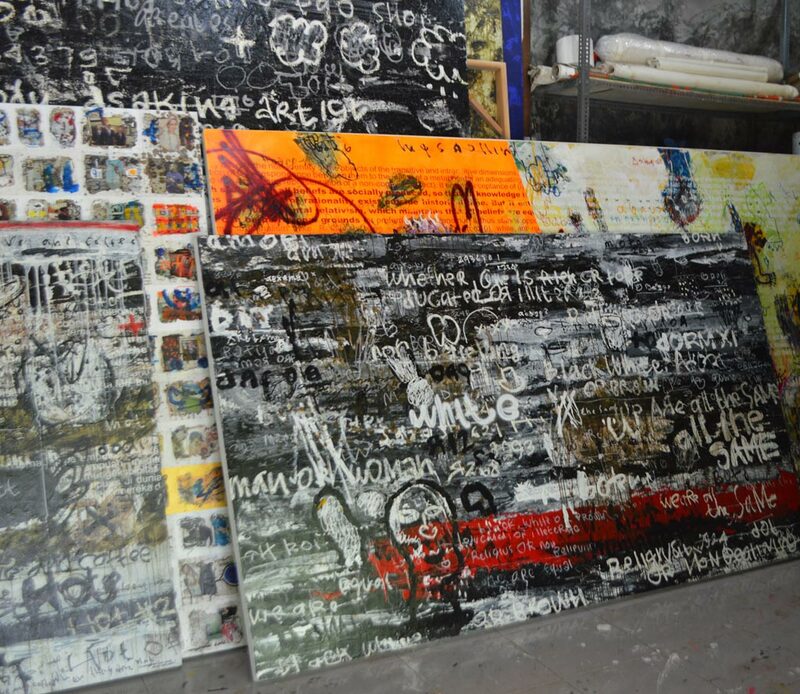 The manifestation of text in his works appear in a mix of several forms, namely screen-printed texts, stream-of-consciousness freehand writing, scribbles, and sometimes as embossed clear texture elements. Often, these texts will have been sourced from articles, book excerpts, or quotations the artist finds through his research. 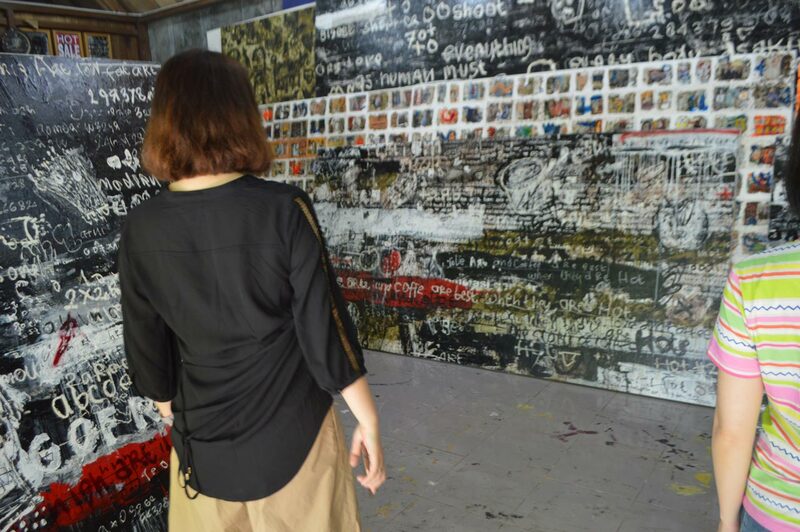 Among his many series of works, one that has been very well received is Dedy’s “Burning Series”, where bits of charred newspapers and magazines are collaged into a rectangular matrix, over which the artist will apply his abstract and naïve figurations, resulting in a tapestry of richly textured and visually enticing artworks. The “Burning Series” of works is essentially Dedy’s critique of the press, whose new-found complete freedom post-Suharto in 1998 made media a free-for-all, one of the side effects being conflicting reports on particular events or newsworthy stories. The incongruous nature of the reports, in some cases, have caused personal and ideological conflicts among individuals, and in a few extreme cases, become the source of violent behavior. In the Indonesian language, “membakar” or ‘burning’ brings the connotation of incitement. Hence, the burning of text-laden materials – in this case newspapers and magazines – perfectly symbolizes the potential conflicts that improper and careless use of text can cause, in turn providing a fantastic conceptual backdrop for Dedy to create some very visually stunning works in the series. Artemis Art will be featuring Dedy Sufriadi’s artworks in the upcoming Art Jakarta 2017 (previously known as Bazaar Art Jakarta), taking place at the end of July this year. While we cannot yet disclose which of the artist’s works will be exhibited, what we can say is that the selection will not disappoint. 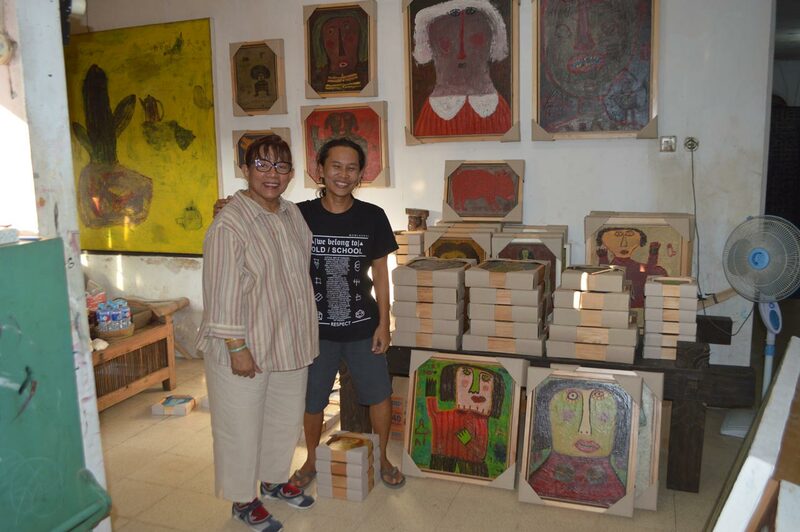 Of the many visual artists based in Yogyakarta whom we’ve had the privilege of getting to know, one whose works are distinctive and unmistakeable world wide would have to be Heri Dono. Infusing elements from wayang and other rich traditional Indonesian cultural components, his works well-known for their sociopolitical commentary. Heri’s body of work covers a wide spectrum – painting, mechatronic installations, and performance art, to name a few. 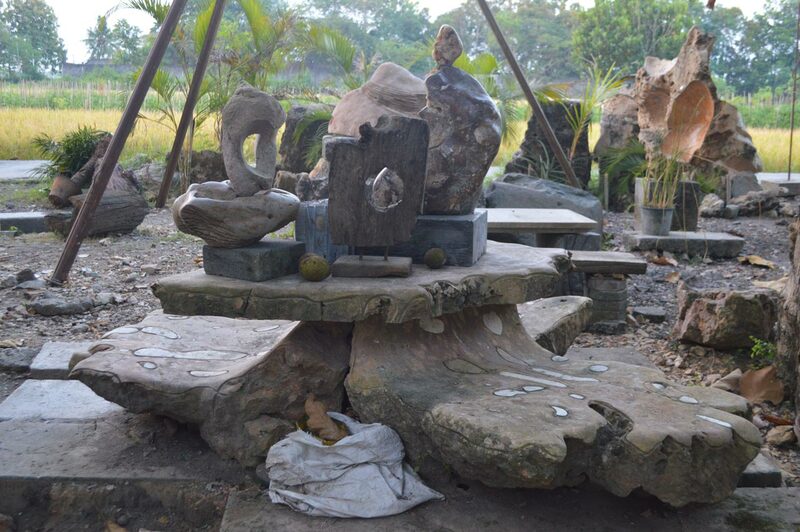 Studio Kalahan, Heri Dono’s studio located in the northwestern edge of Yogyakarta, and is still a work in progress. Since our last visit to the studio in 2016, Studio Kalahan seems to have grown in size! In fact, there are a few small sections that were still in the midst of being constructed during our visit in May this year. 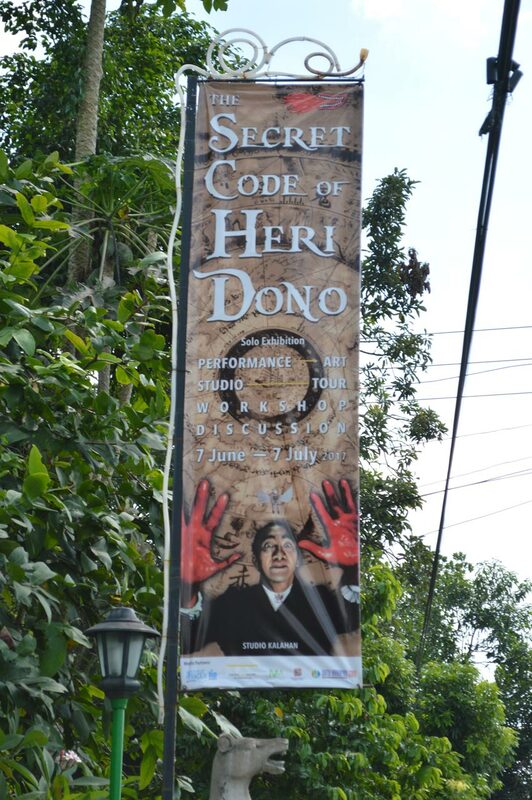 In fact, the studio was being spruced up to host a month-long event called “The Secret Code of Heri Dono”, a solo exhibition of the artist’s works, plus workshops, performances, and discussions, from June 7 to July 7. Since we wouldn’t be in Jogja at the time, it was a privilege for us to visit when we did. Pak Heri was in another meeting when we arrived at Studio Kalahan, but on hand was Ms. Agni Saraswati who walked us through the studio during the almost one hour visit. 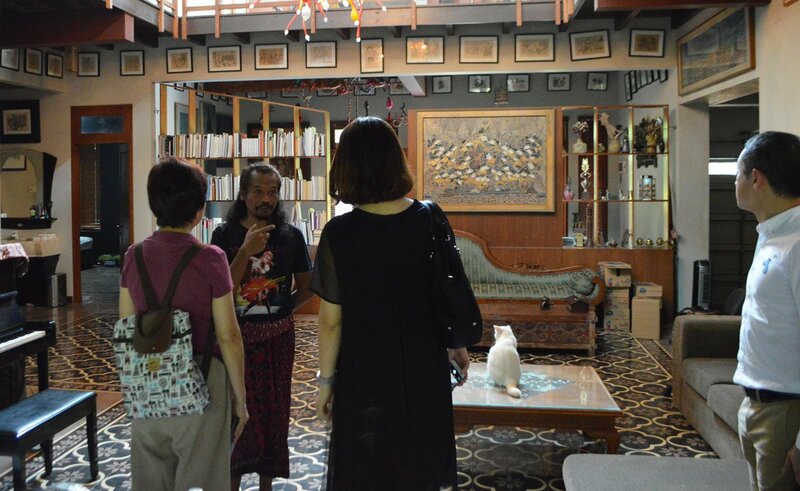 The studio tour primarily covered much of Heri Dono’s installation works going back over a decade, which have been shown in numerous major art fairs around the world, and at previous editions of ArtJog in Yogyakarta. One installation that we recognized was the horse-pulled hearse that was part of ArtJog 9 – Universal Influence last year. Banner outside Studio Kalahan announcing "The Secret Code of Heri Dono"
We did a short video to document the visit, which we thought would be the best way to share the experience, rather than just write about it. Heri Dono, throughout his recent career, has incorporated many elements from the rich cultural cache that is Indonesia, using them to create works that are sociopolitically relevant at a given time. The video, which captures most of our tour of his installation art, provides a glimpse of this. 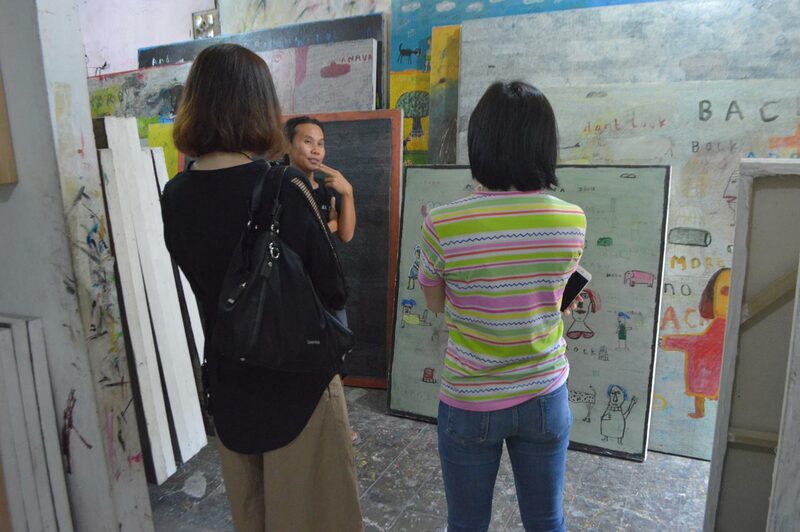 Among those in our small entourage for the visit to Studio Kalahan were Caryn Koh and Haris Rashid, two young Malaysian artists who took up the offer to tag along for our visitation. One of the things we constantly talk about to young Malaysian artists is the Yogyakarta experience, which these two were able to experience first-hand. Among other things, we frequently mention about how there is hardly any social barrier between artists, based on their “seniority”, and how artists of any experience are able to socialize and learn from one another. The visit to Heri Dono certainly underscored this point. Pak Heri is one of the most down-to-Earth individuals you’ll ever meet, and from our own experience always willing to share and lend a hand to other artists whenever he can. This is undoubtedly something artists and artist communities elsewhere can learn from, we think. It is what makes Yogyakarta the special place that it is, particularly for artists, art practitioners, and the arts. 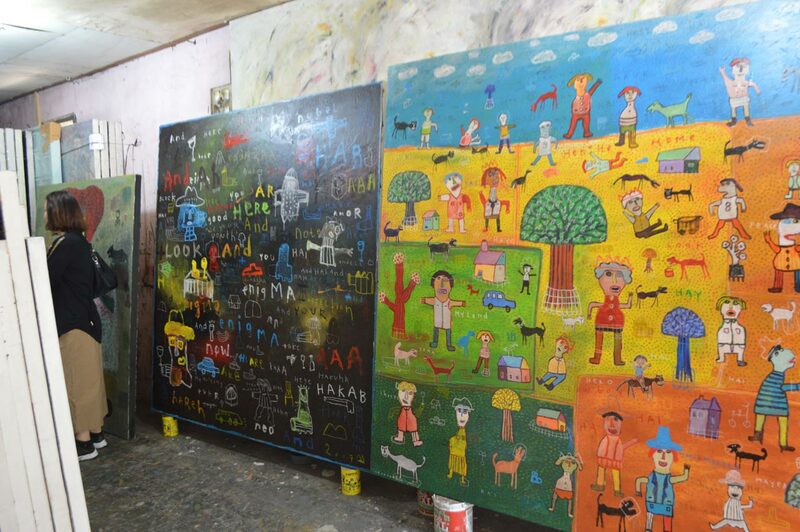 Another Jogja-based visual artist whom we have been featuring quite frequently in the last year or so is Indra Dodi. Originally from Padang, Indra is a graduate from the Institut Seni Indonesia (ISI) like may of his contemporaries, choosing to make Yogyakarta his home. His naïve figurative style is one that he has found some level of success with, as seen earlier this year when we featured him in both Art Central Hong Kong and Young Art Taipei. 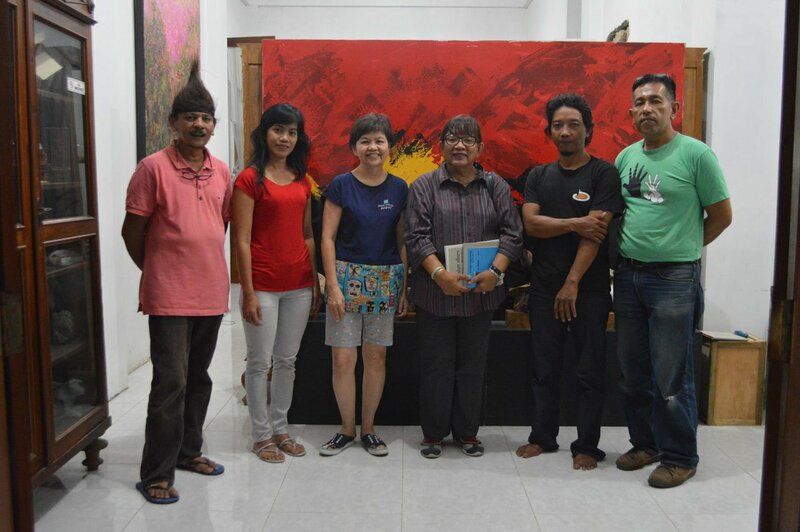 This year’s Jogja Art Weeks period has been a somewhat busy one for Indra Dodi. 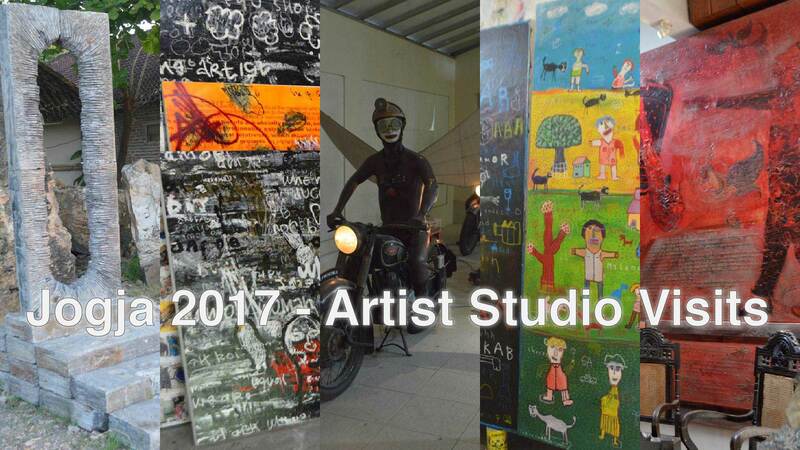 As he has been in the past few years, Indra participated in this year’s Sakato Art Community’s BAKABA #6 – indONEsia exhibition. Sakato is a community of artists originally from Padang, West Sumatra, and includes well-known Indonesian artists like Handiwirman Saputra, Jumaldi Alfi, Rudi Mantofani, and Yunizar. Apart from Bakaba #6, this year Indra Dodi also exhibited in two other group exhibitions, Kecil Itu Indah, After Edwin’s (KI2AE) and Ping Project #3. It’s not unusual for artists to participate in numerous group exhibitions during the one month period of fringe exhibitions surround ArtJog, and being in three different exhibitions is actually considered a somewhat light schedule! Indra style has not always been naïve figurative. This current style emerged some five years ago, before which his body of work consisted of colorfield abstracts. Indra Dodi is quite a personable artist, fond of looking at the lighter side of life, and ever the consummate observer. Just about any experience, mundane as it may be to the casual observer, or story Indra’s heard, might just find its way on to his canvas. Indra Dodi is currently in the planning stages to build a new studio. His current studio occupies the front of his home, which also doubles as his storage and display spaces, which needless to say is somewhat limited. There is no timeline yet for when he plans to complete construction of the new studio, but we expect it to be sometime in the coming year. Indra Dodi will be one of the four artists we will be featuring in Art Jakarta 2017 (formerly known as Bazaar Art Jakarta), which takes place at the end of July later this year, details of which will be provided as the art fair draws closer. Nasirun is a complete artist. His technique is high, his imagination is incredible. He is smart in concept for each of his paintings but he never leaves the aesthetic aspect. In fact, his strongest aspect is his touch of feeling. His works are expressive and imaginative. He is so skillful in working on details and complexities that the decorative elements appear strongly. It seems that Affandi, Sudjojono and Widayat get together to be one in him. It goes without saying that Nasirun is a visual artist held in very high regard by the Yogyakarta art scene. This prolific artist’s works could be seen in a number of group exhibitions throughout Jogja Art Weeks this year, including, most notably, “Linkage” (at the OHD Museum in Magelang) and “The Gift” (at Sangkring Art Space). 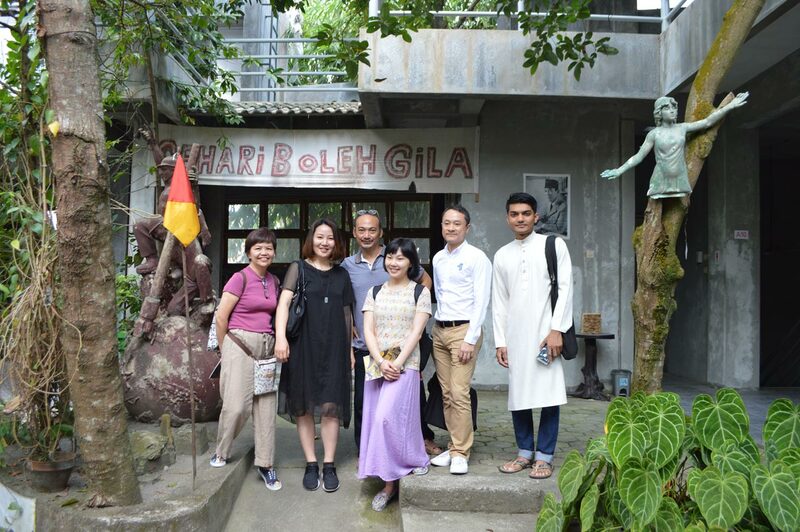 Therefore our trip to Yogyakarta this time around had to include a visit to Nasirun’s museum, primarily for the benefit of our friends from Hong Kong, Malaysia, and the US, for whom we played the role of art guide. Nasirun’s Museum is located just off the kilometer 3 mark along Jalan Wates, close to the center of Yogyakarta. Occupying two separate large residential lots, the museum is a repository of Nasirun’s own work, plus a large collection of other artists’ works, primarily in a separate house just across the small street from his residence/main museum. Originally from the Central Java town of Cilacap, Nasirun studied at the High School for the Arts (SMSR) and later Institut Seni Indonesia (ISI), graduating in 1994. He started getting a lot of attention not long after that, after receiving the McDonald’s Award in 1996, and being selected as one of the ten Best in the 1997 edition of the Philip Morris Indonesia Art Awards. While in high school, Nasirun studied batik, and in the process, learned about the richness contained within the many aspects of Javanese culture, including the many mythologies and tales contributing to the art of wayang and other popular cultural practices and motifs. 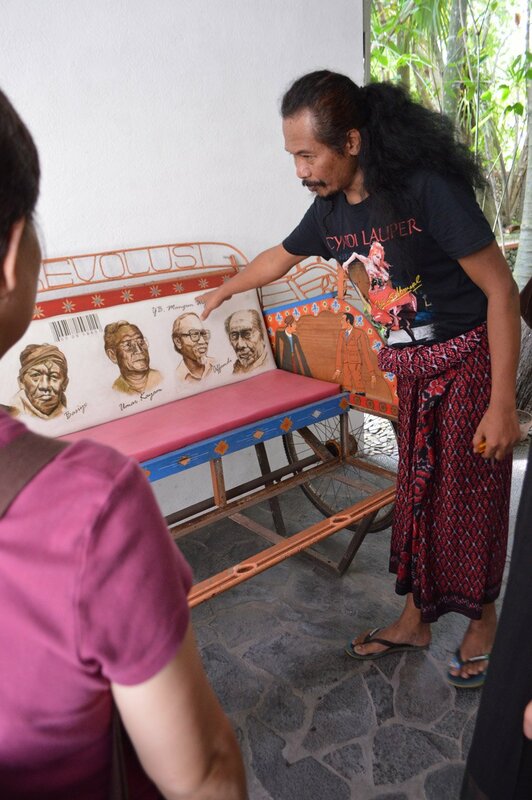 Nasirun explaining one of the works in his collection, "Friends of the Revolution"
His works are rich and layered, with deep red featuring quite prominently in many of them. The many motifs of wayang and Javanese mysticism are infused into his artworks, often critiques about society, told through visual stories taken from the artist’s own life experiences and from the strong cultural consciousness Nasirun possesses. Nasirun’s works are not only done on canvas, but on just about any objects or surfaces imaginable. In his 2016 mega-sized solo “Run“, there were automobiles, mannequins, boats, teak tables, and many other different types of objects, all adored with his art. In one section of his museum, we found an entire section of wall covered with small works, where old metal stamps were combined with carved and painted wood to create unique assemblages. According to Nasirun, these were old metal stamps he had salvaged, and repurposed into artworks. 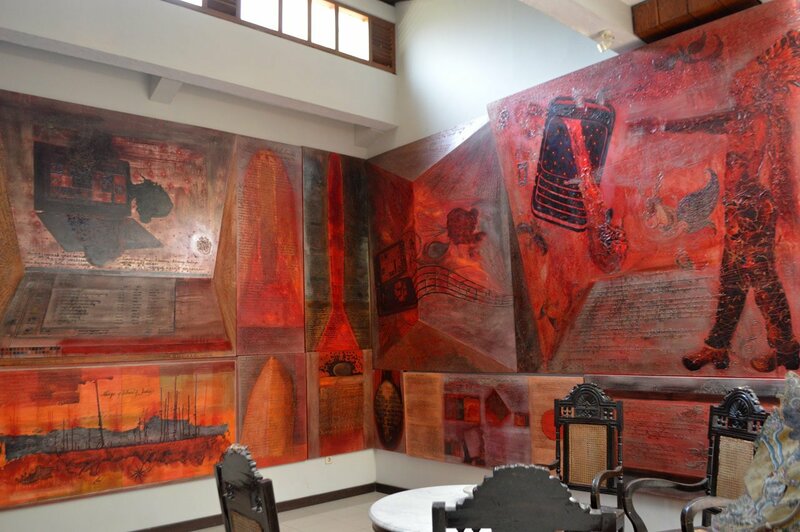 In other parts of his museum, various articles of teak furniture can be seen adorned with his artistic handiwork, including a very large teak dining table where we adjourned to after completing the museum tour in the building across the street. His museum, however, is not just dedicated to his own works. In one section, located in a separate building but within the compound of his home and the main museum, Nasirun has set up a small gallery showing the works of Indonesian old master works that he has collected. It’s his tribute to a an earlier generation of artists that have helped carve the path upon which Indonesian visual art currently walks. Also within his vast collection of art are works by younger artists, the younger generation he’s well known for providing support to. It’s an indication of the sort of person Nasirun is – ever ready to give back to the artistic community that has helped him be the successful artist he is today, and give due recognition to the more senior artists before him. In person, Nasirun is charming and humorous, with a jovial demeanor that immediately disarms you. Looking at his major works, however, reveals an artist who’s very serious about his chosen vocation, and not one who’s “playful” when it comes to his art. What we see in Nasirun is an artist who’s totally at ease with himself, with the ability to project a strong and unique embodiment of the cultural backdrop he grew up in, yet fused with a unique style, technique, and character that is unmistakably his own.